Balushahi: Balushahi is a traditional dessert in northern Indian Cuisine, Pakistani Cuisine, Nepali cuisine and Bangladeshi cuisine. It is similar to a glazed doughnut in terms of ingredients, but differs in texture and taste. 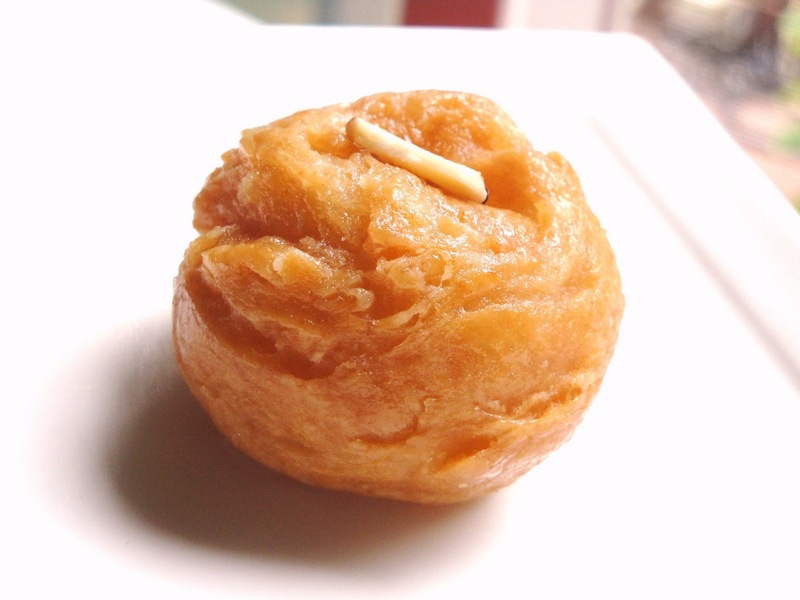 In South India, a similar pastry is known as Badushah. Balushahis are made of refined flour (maida flour), and are deep-fried in clarified butter and then dipped in sugar syrup. Sift together the flour and soda bicarbonate into a large bowl. Rub four tablespoons of ghee into the flour mixture with your fingertips till the mixture resembles breadcrumbs. Add in the beaten yogurt. Cover the dough with a damp cloth and allow it to rest for forty-five minutes. Divide the dough into twelve equal portions and shape into smooth balls. Note: Take care not to overwork the dough. Make a slight dent in the centre of the ball with your thumb. Keep the balls covered with damp cloth. Heat the oil in a non-stick kadai on medium-low heat. Gradually the balushahi will start floating to the top. Turn gently and fry the other side till golden. Note: The entire process may take around half an hour to forty-five minutes. Remove the fried balushahi with a slotted spoon and drain on absorbent paper. Set aside to cool down to room temperature. Add the milk to the cooking syrup. Collect the scum which rises to the surface with a ladle and discard. Continue to cook till the syrup attains a two-string consistency. Soak the cooled balushahi in the sugar syrup for two hours. Gently remove the balushahi from the sugar syrup and place on a serving plate. Set aside for two to three hours till the sugar syrup forms a thin white coating on the balushahi. Serve the balushahi at room temperature. If you have any queries regarding the Balushahi recipe, please leave a comment.